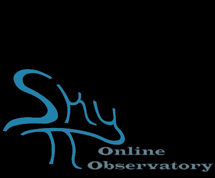 We, at SkyPi R.O., are excited to announce our recent affiliation with Insight Observatory and their tremendous project to bring remote imaging to educational and research organizations as well as individuals who are curious about imaging the skies with highly capable imaging instruments. When fully configured, three instruments will provide access to deep sky objects as well as planets. We encourage you to study the Insight Observatory web page and consider how they can provide a highly enhanced experience for your classroom, research, or personal project. Over the past few decades, the emergence of remotely controlled robotic observatories has opened up endless possibilities. This technology is used for astronomy education in our public schools, universities, and from our own homes. TEO-1: 16″ Astrograph Imaging Telescope with its images acquired of M31, The Andromeda Galaxy and Barnard 33, the Horsehead Nebula. 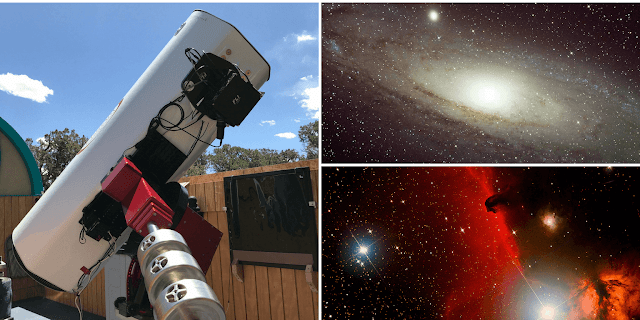 Providing remotely controlled (via our internet portal) robotic imaging, our telescopes are hosted at SkyPi Online Observatories located at an elevation of 7,778 ft in the dark skies of western New Mexico. These telescopes are currently accessible to students, faculty and amateur astronomers for research or deep-sky imaging. 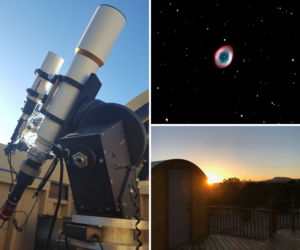 Currently, Insight Observatory houses a 16″ reflector telescope called the Astronomical Telescope for Educational Outreach (ATEO-1) that went online in the summer of 2017. ATEO-2 is a 5″ refractor telescope that is now being added to our network of telescopes and is scheduled to go live in September 2018. ATEO-2: 5″ Williams Optics 132 FLT APO Refractor Imaging Telescope with M57, the Ring Nebula and sunrise over its observatory. The name, ‘Insight Observatory’, was given to the project, as it seemed to be an appropriate designation. The name is relative to its mission: providing insight, to students and the general public, by exposing them to the science of Astronomy, and the research projects that are available for them to participate in, and, possibly, contribute to a discovery. Please browse through our Recent Articles and Posts to see what has been or will be transpiring here at Insight Observatory.